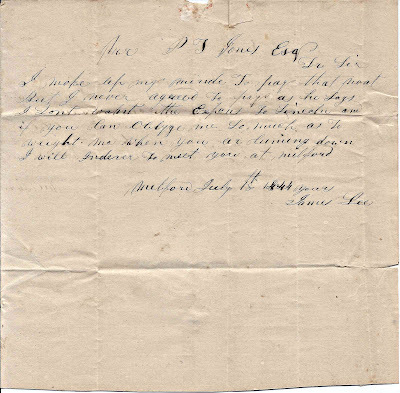 1844 letter from James Lee at Milford, Maine, to Peleg Tolman Jones, Esquire, at Lincoln, Maine. 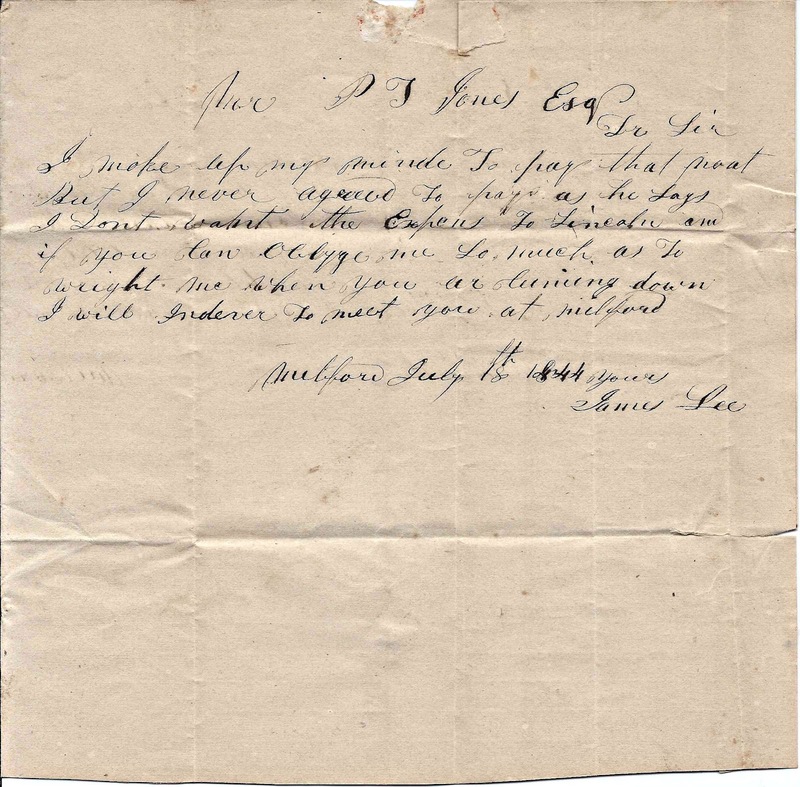 The letter is comprised of a 16" x 8" sheet of paper folded once to dimensions of 8" x 8" before the letter was written and then folded several times in each direction to form a mailable piece. I make up my minde to pay that noat but I never agreed to pay as he says. I don't want the expenses to Lincoln and if you can oblige me so much as to wright me when you are coming down I will endever to meet you at Milford. I think this is the James Lee who was born 17 November 1817 at Pittston or Dresden, Maine, son of Nathan and Rebecca (Puffer) Lee. Rebecca's father James served in the Revolutionary War. On 18 June 1848 at Charleston, Maine, James Lee married Nancy Lane Stewart, daughter of William and Julia Ann (Low) Stewart. She was born 14 May 1831 at Charleston. They raised a family of at least five children at Milford, Maine. James was a lumberman. Sometime after the 1880 Census of Milford, James and Nancy moved to Winthrop, Massachusetts. James died there in 1900, and Nancy in 1914. P. T. Jones, Esquire, was Peleg Tolman Jones, son of Isaac and Jane (McLellan) Jones. He was born at Bowdoin, Maine, on 6 November 1812. According to an excerpt from Dr. Dana Fellows' The History of Lincoln, thankfully put online, Peleg Tolman Jones moved to Lee, Maine, on 6 November 1816, and later to nearby Lincoln, Maine. In 1869 he moved to Bangor, Maine, where he practiced law and served as a Justice of the Peace and as Deputy Sheriff. On 19 April 1847 at Lincoln, Maine, Peleg married Lydia Hall Whittier, daughter of Joseph and Nancy (Locke) Whittier. Lydia was born 6 March 1827 at Lincoln, Maine, as shown in the Maine Birth Records (or Dover, New Hampshire, as some online trees show). 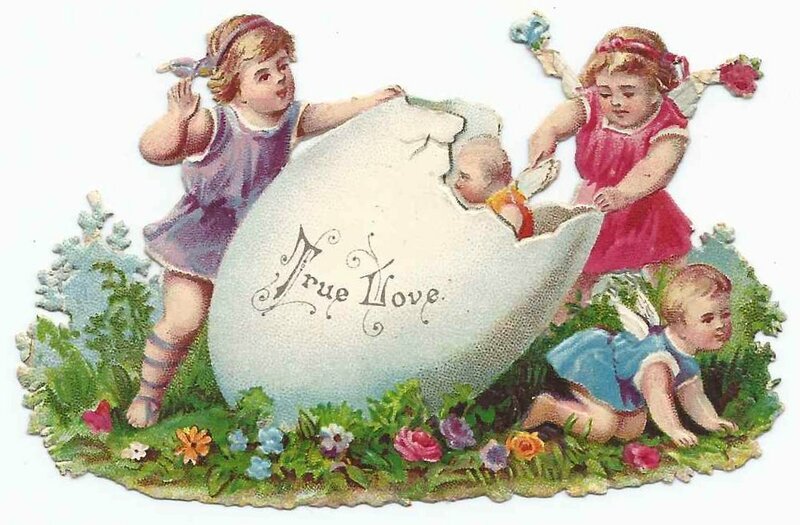 Peleg and Lydia had three children: Freeland; Mary Emma; and Harlow Frank. Peleg died 13 September 1895 at Bangor. Lydia died 11 November 1911 at Bradley, Maine. If you have corrections or additions to the information presented on James Lee and Peleg Tolman Jones, please leave a comment or contact me directly. 1880s autograph album of Jane Mendell Briggs, "Jennie", of Smithfield, Rhode Island. Note: be sure to read the comments sections for additional information and clarifications from a New England researcher. The album is approximately 5" x 3" and contains 36 pages signed by Jennie's relatives and friends. See the complete list of signers in alphabetical order at the end of this post. Jane Mendell Briggs was born 9 October 1869 at Barrington, Rhode Island, the daughter of Nathaniel Parke Briggs and Sarah Martin (Sweetland) Briggs, who were born in Massachusetts and Rhode Island respectively. Her paternal grandparents were Nathaniel and Jane (Mendell) Briggs. Her maternal grandfather was James L. Sweetland. I don't have the name of Jennie's maternal grandmother, who I'm assuming died before 13 October 1851, the date that James married Ellen Whipple. I found a Rhode Island death record for a Maria Sweetland who died on 1 December 1849, but I don't know if she is the person I'm seeking. If she is, her death may have resulted in part from Sarah's birth a month earlier. One site online has James L. Sweetland married to a Sarah Martin, daughter of Benjamin Martin. They had a daughter Sarah Martin Sweetland who married Nathaniel P. Briggs, so all would seem to fit, including the name Martin which was Sarah Martin (Sweetland) Briggs' middle name. However, I think some family members got mixed up, as the dates of birth of the mother and daughter Sarahs are too close, 1844 and 1849. It's possible that the mother Sarah in question was actually Benjamin's sister Sarah Ann Martin, born 18 June 1819, daughter of Samuel Reed Martin and Sally (Bowen) Martin, and that the James L. Sweetland mentioned was actually the brother of Sarah Martin (Sweetland) Briggs. If you have information that would clear up the mystery of Jennie's maternal grandmother, please leave a comment or contact me directly. Thanks. Jennie's mother Sarah Martin (Sweetland) Briggs signed a page in the album in 1885. The person who signed a page N. P. Briggs, Jr., was likely Jennie's brother Nathaniel Parke Briggs, Jr. Their father's father was also Nathaniel Briggs, which concerns me a bit, but I'm not sure his middle name began with a P, so I'm hoping the Parke middle name began with Jennie's father. Another person signed a page J. L. Sweetland in 1884. I'm not sure when Jennie's maternal grandfather died, so this may or may not be his signature. He had a son James L. Sweetland, Jr., Jennie's maternal uncle, and I'm leaning toward this being the latter's signature. Frank H. Sweetland of Burlington, Vermont signed a page in Jennie's album in 1890 [written over another date which looks like 1880 but was probably corrected by the author]. Frank was the younger half brother of Jennie's mother Sarah Martin (Sweetland) Briggs. His parents were James L. Sweetland and his second wife Ellen Whipple. An Ida L. Briggs of Smithfield, Rhode Island, signed a page in 1886. Two people, mother and daughter, called themselves Jennie's cousins. Mrs. S. C. M. Rogers of Central Village, Connecticut, signed a page as cousin. She was Sara C. (Morse) Rogers, married to Civil War surgeon Dr. Charles H. Rogers, who also signed a page, along with their daughter S. Lillian Rogers. The latter two dated their pages 1885. An L. P. Briggs signed a page in 1884. It was written under a piece of Victorian scrap. In 1894 Jennie married Albert Lincoln Latham, son of Daniel and Louisa Abby (Mowry) Latham and raised a large family at Smithfield, Rhode Island. Albert died in 1838 and Jennie in 1957. Note: Many people from the Mowry family signed pages in Jennie's album. If you have corrections and additions to the information on the Briggs and Sweetland families, or if you have insights into any of the signers listed below, please leave a comment or contact me directly. J. L. Sweetland, 1884; possibly Jennie's maternal grandfather James L. Sweetland, if he was still alive then, or his son, James L. Sweetland, Jr.
1880s autograph album of Marguerite Lon "Maggie" Cox of Crawfordsville, Indiana. Maggie signed the inside back cover of her album. The album is approximately 4" x 2-3/4" and contains about 40 pages signed by Maggie, her relatives and friends. A complete list of the signers, in alphabetical order, appears at the bottom of this post. Marguerite Lon Cox was born 6 August 1873 in Montgomery County, Kentucky, daughter of Winfield Scott Cox and Armina Jameson (Daniel) Cox, both Kentucky natives. Armina Jameson (Daniel) Cox signed a page in her Maggie's album as "your best friend, your Mother". There are some pages written in the album that aren't signed, and Maggie's father may have written one of them. Maggie's sister Bettie Bland Cox signed at least three pages and perhaps more. Maggie's Aunt Lizzie signed two pages. Maggie's father had a sister Elizabeth Cox, born in 1868, who may or may not have been the author of the pages below. Maggie's mother had a sister Elizabeth Jameson Daniel, but she died in 1878 before Maggie started collecting autographs. Maggie Cox married William E. Smith on 21 July 1897 at Crawfordsville, Indiana. I've had a hard time collecting information on William. He may have been the son of Nancy Frances (Knox) and her second husband Samuel L. Smith. The page signed by E. A. Batchelder in 1884 included the phrase "City Schools", leading me to wonder if he or she might have been Maggie's teacher. If you have corrections or additions to the information above, or insights into any of the signers below, please leave a comment or contact me directly. Armina Jameson Daniel, Maggie's mother, signed a page as "your best friend, your Mother"
Pearl Lucas, 1885; middle initial might be C.
1880s autograph album that I believe belonged to Ruby Brown of Unionville Center, Ohio, judging from the clues of three signers who declared themselves to be Ruby's cousins. My hesitation is that many online trees don't show Ruby as a girl, but rather as Reuben Wright Brown; one tree, however, had both Reuben and a Ruby, born a couple years later, so I'm hoping that tree is correct. At first, before researching the cousins, I found a Ruben Nathaniel Converse from Ohio who might have fit the bill, as there are people by the name of Converse who signed pages in the album. That possible Ruby, however, was a man, and at least one of the pages in the album, signed by Hamer Maddex in 1884, implies that Ruby was a girl. The album is approximately 5" x 3" and is missing half of its front cover and half of its back cover. It contains about fifty pages signed by Ruby's relatives and friends. A complete list of the signers, in alphabetical order, appears at the bottom of this post. Ruby Brown was born about 1873 in Ohio, daughter of Andrew and Nancy E. (Valentine) Brown, both born in Ohio. Her paternal grandparents were Andrew and Mary (Jolley) Brown. There's a page in the album signed by Ruby's cousin Jolley Martha of Marysville, Ohio. She may have been in the habit of reversing her names, for effect. Ruby's maternal grandparents were James Fuhrman Valentine and Anna (Herron) Valentine. In addition to Martha Jolley, two other cousins signed pages in Ruby's album. 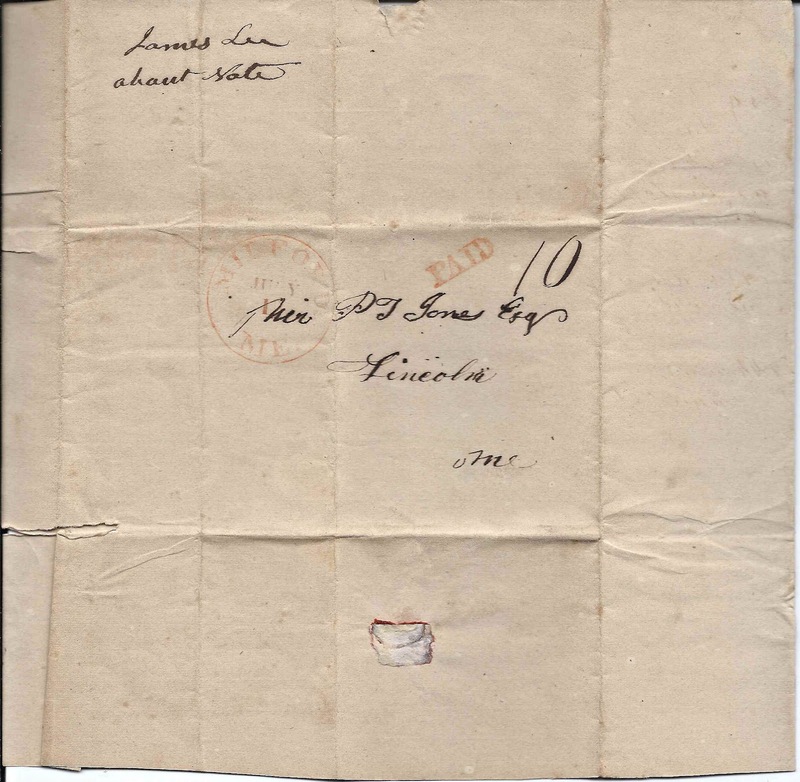 Cousin Jennie Pixley of Columbus, Ohio, signed a page in 1884. Her mother, Margaret (Valentine) Pixley, was the older sister of Ruby's mother, Nancy (Valentine) Brown. Ruby's cousin-in-law Ada K. (Shively) Robinson of Wooster, Ohio, signed a page in 1884. Ada's husband David E. Robinson was the son of Mary Jane (Valentine) Robinson, oldest sister of Ruby's mother Nancy (Valentine) Brown and Jennie Pixley's mother, Margaret (Valentine) Pixley. 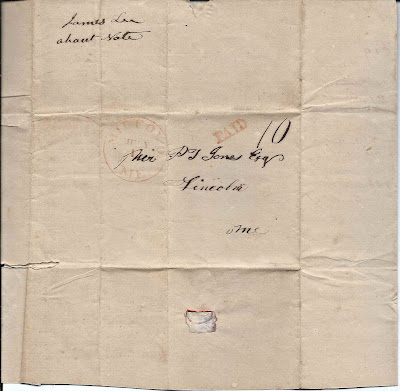 Ada K. (Shively) Robinson's mother, Catherine Ann (Funk) Shively, also of Wooster, Ohio, signed a page in 1884. If you have information on the Ruby who owned this autograph album, especially if you feel she is someone other than Ruby Brown, please leave a comment or contact me directly, so that I can make corrections. I'd also appreciate hearing from you if you have information on any of the signers listed below. The album was owned by a Ruby, who I think was Ruby Brown of Unionville Center, Ohio. Ed Miller, 1886; his name could be Thom Ed Miller, or Thom could be the word "from"
1880s/1890 autograph album of Harry Butters Hurd of 104 Orange Street, Chelsea, Massachusetts. The album is approximately 3-1/2" x 2-1/4" and contains 23 pages signed by Harry, his relatives and friends. A complete list of the signers appears at the bottom of this post. Harry Butters Hurd was born 8 March 1877 at Chelsea, Massachusetts, son of Herbert I. Hurd and Mary Olivia (Butters) Hurd, New Hampshire natives. Harry's paternal grandparents were John Shepard Hurd and Susan Antriss Woodbury (Dame) Hurd. His maternal grandparents were Charles Hutchins Butters and Julia Ann (Trescott) Butters. Harry's father, Herbert I. Hurd, signed a page in the album in 1884. Harry's older brother Charles Herbert Hurd, who was born 22 January 1875 at Pittsfield, New Hampshire, signed a page in the album in 1885. Harry's uncle, George Brewster Hurd, then living on Shawmut Avenue in Boston, Massachusetts, signed a page in 1884. George was Herbert's younger half brother from John Shepard Hurd's second marriage to Johanna (Brewster) Hurd. Harry's aunt Clara T. Butters of Chelsea, Massachusetts, younger sister of his mother Mary Oliver (Butters) Hurd, signed a page in 1884. Three of Harry's cousins signed pages in his album. Gusta J. Berry signed a page in 1885. She was Augusta J. Berry, daughter of Elwin and Emma J. (Hurd) Berry. Emma J. was a full sister to Harry's father Herbert I. Hurd. Harry's cousin Ada Blanch Scates of Northampton, Massachusetts, signed a page in 1884. Ada was the daughter of David W. and Lyminia Walker (Butters) Scates. Lyminia was the older sister of Harry's mother Mary Oliver (Butters) Hurd. Harry's cousin Gracie signed a page. Gusta J. Berry, 1885; Harry's cousin Augusta J. Berry, daughter of Elwin and Emma J. (Hurd) Berry. Emma was the older sister of Harry's father Herbert I. Hurd. If you have corrections to the information above or information about the Hurd and Butters families or any of the signers, please leave a comment or contact me directly. 1880s autograph album of Frank B. Gasche of Pettisville, Ohio. I believe his birth name was Benjamin Franklin Gasche, but I'd like readers' confirmation of that. See another post that features the 1880s autograph album of Frank's future wife Vinnie Blanche Shaffer of Tedrow, Ohio. The album is approximately 5-1/4" x 3-1/4" and contains thirty-seven pages signed by Frank and his relatives and friends. See an alphabetical list of the signers at the end of this post. Benjamin Franklin Gasche was born 9 March 1868 at German, Ohio, in Fulton County, son of George and Catherine (Honeberger) Gasche, who were German immigrants. I think Frank was the youngest of five children born to George and Catherine. Neither Frank's parents, nor his siblings, signed pages in his album. Two of Frank's Honeberger cousins, however, signed pages. They were siblings Charles and Lulu, children of Catherine's younger brother George Honeberger and his wife Ann (Goodman) Honeberger. Charles Honeberger of Loudonville, Ohio, signed a page in 1885. Sadly, Charles died in 1888. Lulu Honeberger of Loudonville, Ohio, signed a page on 10 August 1885. She died just over a month later. From the appearance of her handwriting, hers was not a sudden illness. Assuming Frank B. Gasche is Benjamin Franklin Gasche, he appeared to start using the latter name as he entered adulthood. On 22 December 1891, he married Vinnie Blanche Shaffer of Tedrow, Ohio, daughter of John and Fidelia Elenor Ella (Boyer) Shaffer. Frank and Vinnie Blanche (Shaffer) Gasche raised at least two children, both daughters, at German, Ohio, where they farmed. 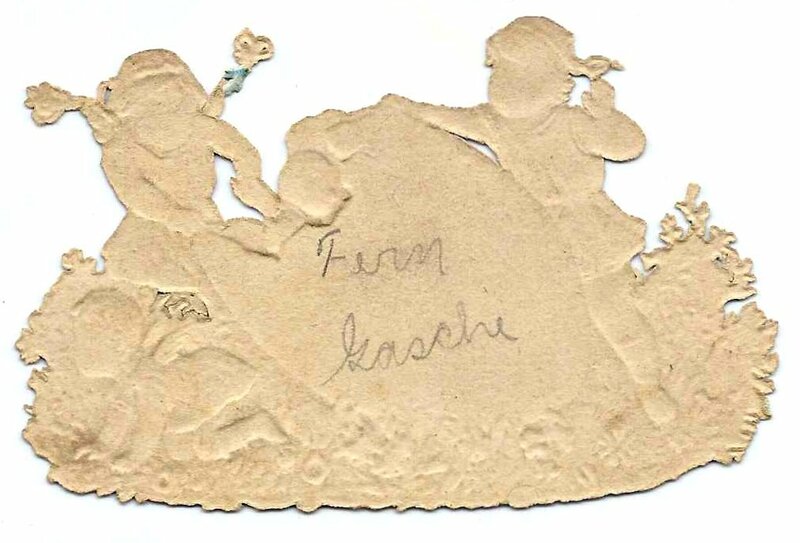 One of their daughters, Fern, wrote her name on a Victorian scrap tucked inside her mother's album. The page below was written in what I assume to be German. If you can decipher the name of the signer and/or translate the page, please leave a comment or contact me directly. Another page, again with a signer whose name I'm not sure of, decorated the page with two humorous scraps. Either two people named Weber signed adjoining pages or Jacob J. Weber of Elmira, Ohio's offering spanned adjoining pages. He included a nice sketch. Lulu Honeberger of Loudonville, Ohio, 10 August 1885; Frank's cousin. Sadly, Lulu died very soon after she signed, on 14 September 1885, which is probably why her handwriting appears very shaky, poor soul. J. H. Schaffner of Spring Hill, Ohio; friend. Not sure of middle initial - could be W.